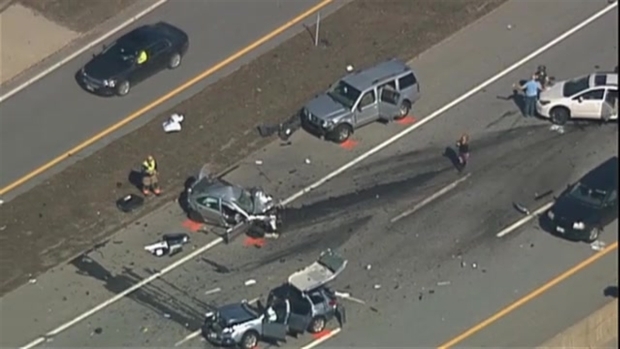 A robbery, stabbing and police chase ended in a crash involving eight vehicles on Friday afternoon on the Everett Turnpike in Nashua, New Hampshire. 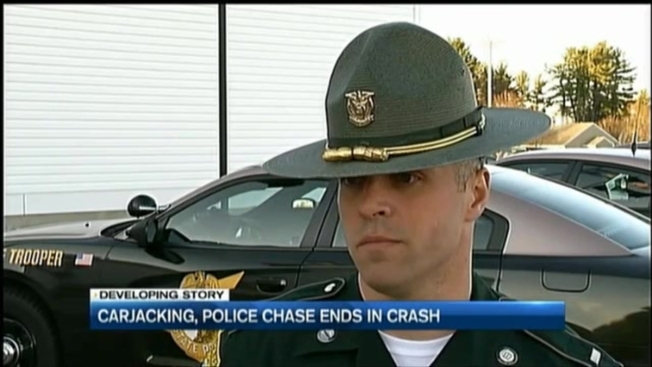 New Hampshire State Police Sgt. Nate Noyes said the incident began as a robbery in Nashua on Friday afternoon. The suspect fled the robbery and crashed his vehicle on the Everett Turnpike in the area of exits 4 and 5. Police were on scene after a major crash in Nashua, New Hampshire. Noyes said a good Samaritan stopped and tried to assist the suspect, but the suspect stabbed her and stole her vehicle, police said. Nashua police located the suspect and chased him south into Massachusetts. The suspect then turned around and headed northbound back into Nashua. He lost control of the vehicle in the area of exit 4, struck eight other vehicles and was ejected. Police say 31-year-old Jonathan Calvin stabbed a driver, stole this car from her and crashed it in Nashua, New Hampshire. Police tried to take him into custody, Noyes said, and he allegedly fought with them before he was eventually apprehended. 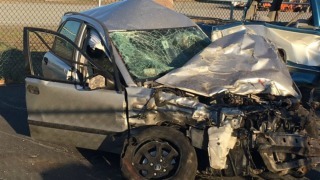 The suspect, 31-year-old Jonathan Calvin, was arrested after the crash. A phone number listed for him wasn't in service Friday. Emergency officials did not immediately know the total number of people injured. The multi-car accident shut down the Everett Turnpike for several hours on Friday afternoon. Aerial footage from the scene showed multiple cars with serious damage still in the middle of the highway. The New Hampshire Department of Safety said at 4:30 p.m. that the highway would remain closed for another hour. Exit 4 was also closed. Highway officials said traffic was being routed around the closure and through the Route 4 bypass.